Restore the virtual machines from the IDrive account to your VMware environment in a fast, secure and reliable way. 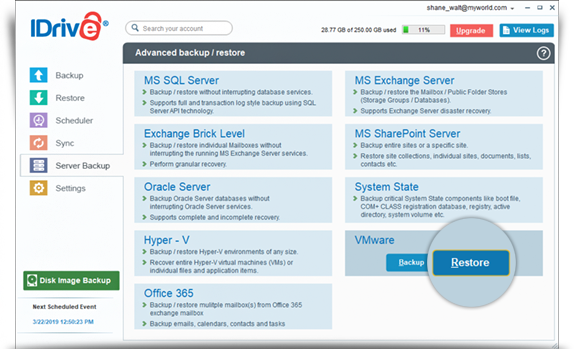 After the 'IDVMwareBackup' folder has been successfully restored to the local computer, go to the ‘Server Backup’ tab and click ‘Restore’ in the VMware section. Enter 'IP address', 'Username', 'Password', and click 'Login to ESX'. 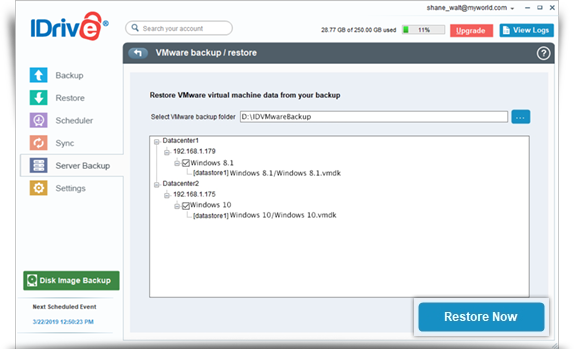 Browse and select the 'IDVMwareBackup' folder from your local computer. Select the virtual machine(s) you want to restore to your VMware server and click ‘Restore Now’.